This is one of the most historical sights on the island of Ireland. 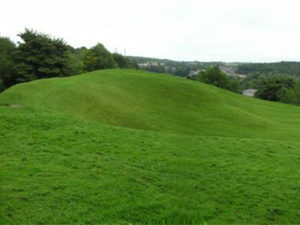 It dates back to the Iron Age and is beside the first known hunter-gatherer settlement inIreland, dating to pre-7000BC. The fort was discovered in the 1970’s by archaeologists. During their excavations, they uncovered artifacts between 9,500 and 10,000 years old. They also discovered that the people who lived then around 7000BC had a rich diet of salmon (from the adjacent River Bann), pig, duck and pigeon. There is a forest walk which goes from the high pointed Mountsandel Fort to the banks of the Bann and passes close to the weir at the Cutts.